More than 3.5 million women and children under five die each year in poor countries due to underlying undernutrition. Many of these are associated with concomitant micronutrient deficiencies. In the last decade point of use or home fortification has emerged to tackle the widespread micronutrient deficiencies. We in this review have estimated the effect of Micronutrient Powders (MNPs) on the health outcomes of women and children. We systematically reviewed literature published up to November 2012 to identify studies describing the effectiveness of MNPs. We used a standardized abstraction and grading format to estimate the effect of MNPs by applying the standard Child Health Epidemiology Reference Group (CHERG) rules. We included 17 studies in this review. MNPs significantly reduced the prevalence of anemia by 34% (RR: 0.66, 95% CI: 0.57-0.77), iron deficiency anemia by 57% (RR: 0.43, 95% CI: 0.35-0.52) and retinol deficiency by 21% (RR: 0.79, 95% CI: 0.64, 0.98). It also significantly improved the hemoglobin levels (SMD: 0.98, 95% CI: 0.55-1.40). While there were no statistically significant impacts observed for serum ferritin and zinc deficiency. Our analysis shows no impact of MNPs on various anthropometric outcomes including stunting (RR: 0.92, 95% CI: 0.81, 1.04), wasting (RR: 1.13, 95% CI: 0.91, 1.40), underweight (RR:0.96, 95% CI: 0.83, 1.10), HAZ (SMD: 0.04, 95% CI: -0.13, 0.22), WAZ (SMD: 0.05, 95% CI: -0.12, 0.23) and WHZ (SMD: 0.04, 95% CI: -0.13, 0.21), although showing favorable trends. MNPs were found to be associated with significant increase in diarrhea (RR: 1.04, 95% CI: 1.01, 1.06) with non-significant impacts on fever and URI. Our analysis of the effect of MNPs in children suggests benefit in improving anemia and hemoglobin however the lack of impact on growth and evidence of increased diarrhea requires careful consideration before recommending the intervention for implementing at scale. More than 3.5 million women and children under five die each year in poor countries due to underlying undernutrition . An estimated 178 million children under five are stunted and 55 million children are wasted . Of these stunted children, 160 million (90%) live in just 36 countries, representing almost half of the children in those countries  and many of these children have concomitant micronutrient deficiencies. Deficiencies in vitamin A, iron, zinc and iodine are the most prevalent, accounting for 11% of global disease burden . The World Health Organization (WHO) estimates that of the roughly two billion people suffering from micronutrient deficiencies, 85% live in resource poor settings and these often occur as multiple rather than single micronutrient deficiencies . The prevalence is especially high in Southeast Asia and sub-Saharan Africa. Iron deficiency is widespread and globally about 1.62 billion people are anemic with the highest prevalence among preschool children (47%) followed by pregnant women (42%) . Iodine deficiency (IDD) is a public health problem in 130 countries and affects 13% of world's population . Globally about 740 million people are affected by goiter, and over two billions are considered at risk of IDD. It is estimated that one-third of the world population live in countries with a high prevalence of zinc deficiency. Clinical Vitamin A Deficiency (VAD) affects at least 2.80 million preschool children in over 60 countries, and sub clinical VAD is considered a problem for at least 251 million that includes school-age children and pregnant women . Micronutrients play a critical role in cellular and humoral immune responses, cellular signaling and function, learning and cognitive functions, work capacity, reproductive health and even in the evolution of microbial virulence [9, 10]. Infants, children and pregnant women have high demands for vitamins and minerals because of increased growth and metabolic requirements and yet their dietary intake often fails to meet these requirements [3, 11]. In children these micronutrient deficiencies can cause anemia , restrict growth  and hamper motor and cognitive development  and also effect the immune function . Under nutrition in children and women leaves a long term impact on population health and productivity. Several strategies have been employed to supplement micronutrients to women and children [16–19]. These include nutrition education, dietary modification, food provision, supplementation and fortification. In the last decade point of use or home fortification of maternal and child diets has emerged to tackle the widespread micronutrient deficiencies. Multiple Micronutrient Powders (MNPs) or Sprinkles are powdered encapsulated vitamins and minerals that can be added to prepared foods with little change to the food’s taste or texture. MNPs are designed to provide the recommended daily nutrient intake of 2 or more vitamins and minerals to their target populations. Despite the wide body of primary research on MNP interventions, there are few syntheses of the existing data. A recent Cochrane review has established that MNPs appear effective for reducing anemia and iron deficiency for children under 2 years of age . We in this review have estimated the effect of these MNPs on the health of women and children. We have reviewed the available literature and evaluated the quality of included studies according to the Child Health Epidemiology Group (CHERG) adaptation of Grading of Recommendations, Assessments, Development and Education (GRADE) criteria . We systematically reviewed literature published up to November 2012 to identify studies describing the effectiveness of MNPs. Following CHERG Systematic Review Guidelines , we searched PubMed, Cochrane Libraries, Embase, and WHO Regional Databases to identify all published and unpublished trials. Additional studies were identified by hand searching references from included studies. Search terms included combinations of Micronutrient* OR ‘multiple micronutrient” OR “multi-vitamin” OR “multi-mineral” OR “micronutrient powder” OR MNP OR sprinkle AND Fortifi* OR “food fortifi*” OR “point of use” OR “home fortification”. No language or date restrictions were applied in the searches. MNPs were identified as point-of-use powders with two or more micronutrients in their formulation. Studies were included that provided MNPs either in the home or at designated centers, using different multiple micronutrient formulations, with different dosages and duration. Studies that included supporting interventions such as nutrition education were included only if the supporting interventions were given to both the intervention and comparison groups, so that the difference between the two groups was solely of MNPs. Because of the unique nature of this intervention and a need to do a separate analysis specifically for this intervention, we excluded studies examining the impact of supplementary food provision, lipid-based supplements, micronutrient crushable tablets or foodlets, fortified milk or complementary foods and other fortified foods and beverages including fortified seasoning powders. We abstracted data describing study identifiers and context, study design and limitations, intervention specifics and outcome effects into a standardized abstraction form for studies that met the final inclusion criteria as detailed in the CHERG Systematic Review Guidelines . Outcomes of interest included hematological; anemia, hemoglobin levels, serum micronutrient levels, anthropometric; stunting, wasting, underweight, weight for age z-score (WAZ), height for age z- score (HAZ), weight for height z-score (WHZ), head circumference and morbidity; diarrhea, upper respiratory infections (URI), fever and mortality among women and children. Each study was assessed and graded according to the CHERG adaptation of the GRADE technique . We conducted a meta-analysis for individual studies and pooled statistics were reported as the relative risk (RR) for categorical variables and standard mean difference (SMD) for continuous variables between the experimental and control groups with 95% confidence intervals (CI). Mantel–Haenszel pooled RR and corresponding 95% CI were reported or the DerSimonian–Laird pooled RR and corresponding 95% CI where there was an unexplained heterogeneity. All analyses were conducted using the software Review Manager 5.1. Heterogeneity was quantified by Chi2 and I2, which can be interpreted as the percentage of the total variation between studies that is attributable to heterogeneity rather than to chance, a low p-value (less than 0.1) or a large chi-squared statistic relative to its degree of freedom and I2 values greater than 50% were taken as substantial and high heterogeneity. In situations of high heterogeneity, causes were explored by sensitivity analysis and random effect models were used. We summarized the evidence by outcome, including qualitative assessments of study quality and quantitative measures, according to the standard guidelines. A grade of “high”, “moderate”, “low” and “very low” was used for grading the overall evidence indicating the strength of an effect on specific health outcome according to the CHERG Rules for Evidence Review . We identified 2556 titles from search conducted in all databases. 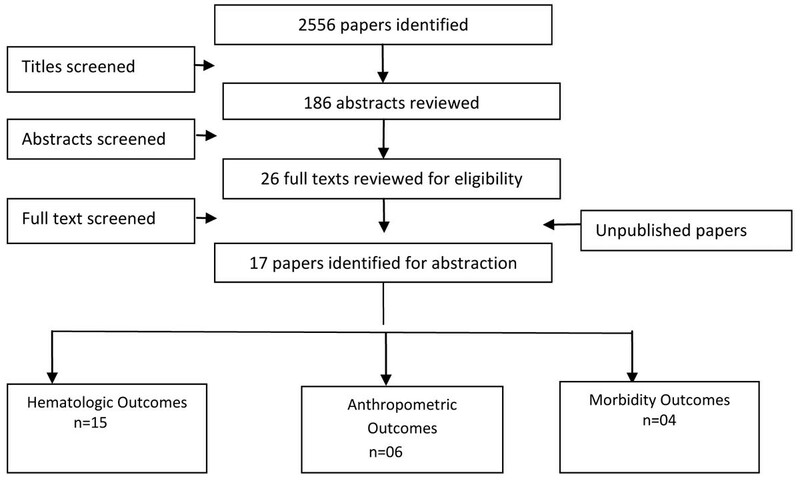 After screening titles and abstracts, we reviewed 26 papers for the identified outcome measures of interest of which 11 papers investigated either multiple micronutrient spreads or seasonings and were excluded from this review and 17 [22–38] studies were finally selected for inclusion which evaluated the impact of MNP versus no intervention or control and reported the outcomes of interest (Figure 1). Most of the studies were done on children aged 6 months to 6 years of age, while two studies had children up to 11 years of age. All studies were conducted in developing countries. There were no studies identified which were on women and met our inclusion criteria. None of the included studies reported on the outcome of mortality. 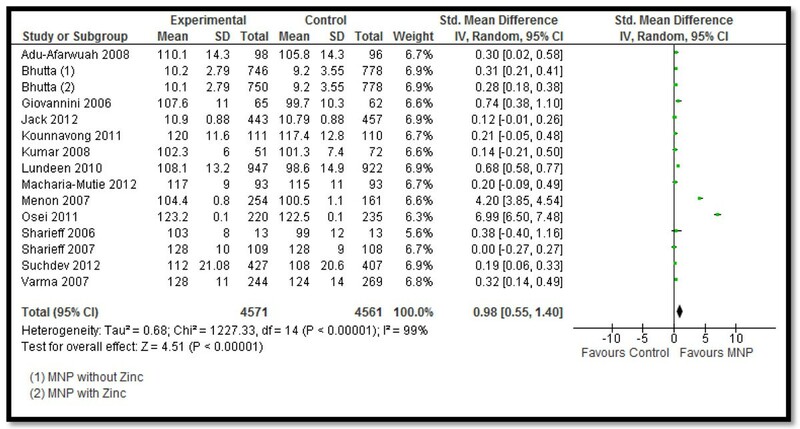 Table 1 shows the characteristics of the included studies. Fe- 12.5mg (fumarate), Zn- 5 mg (gluconate), Vitamin C - 50mg, Vitamin A - 300mg, Vitamin D3-7.5mg, Folic acid - 150mg, Potato maltodextrins SQ to 1 g.
In Table 2 and 3, we report the quality assessment of studies by outcomes. All the evidence was of moderate outcome specific quality. For the hematologic indicators (Table 2), the findings were based on 15 studies. MNPs significantly reduced the prevalence of anemia by 34% (RR: 0.66, 95% CI: 0.57-0.77) (Figure 2), iron deficiency anemia by 57% (RR: 0.43, 95% CI: 0.35-0.52) and retinol deficiency by 21% (RR: 0.79, 95% CI: 0.64, 0.98). It also significantly improved the hemoglobin levels (SMD: 0.98, 95% CI: 0.55-1.40) (Figure 3). MNPs did not show a significant improvement in serum ferritin concentration and zinc deficiency. The duration of the studies ranged from 2-12 months and the age of the children from 6 months to 10 years. Studies ranged in duration from 2-12 months. Study duration ranged from 6-8 months. The study duration ranged from 6-8 months. The study duration ranged from 6-12 months. All studies included more than 3 micronutrients. The studies ranged in duration from 4-12 months. All studies included more than 3 micronutrients. The studies ranged in duration from 6-12 months. Number of micronutrients ranged from 5-15. Duration varied from 2-12 months. One of the studies targeted children in school. Number of micronutrients ranged from 5-14. Duration varied from 8-12 months. One of the studies targeted children in school. For the anthropometric outcomes (Table 3), data was pooled for six studies. MNPs did not show a significant improvement in any of the anthropometric outcomes including stunting (RR: 0.92, 95% CI: 0.81, 1.04), wasting (RR: 1.13, 95% CI: 0.91, 1.40), underweight (RR:0.96, 95% CI: 0.83, 1.10), HAZ (SMD: 0.04, 95% CI: -0.13, 0.22), WAZ (SMD: 0.05, 95% CI: -0.12, 0.23) and WHZ (SMD: 0.04, 95% CI: -0.13, 0.21), although showing favorable trends, as the direction of effect was on the positive side although non-significant. For the morbidity outcomes (Table 3), data from four studies was pooled. MNPs were associated with significant increase in the incidence of diarrhea (RR: 1.04, 95% CI: 1.01, 1.06) (Figure 4), while there was no significant rise in recurrent diarrhea (RR: 2.86, 95% CI: 0.12-69.0), fever (RR: 1.03, 95% CI: 0.70, 1.51) and URI (RR: 1.17, 95% CI: 0.71, 1.92). Of the outcomes assessed for the effect of MNPs in children, we applied the CHERG rules for evidence review to these outcomes. There was no data on mortality and the evidence on anthropometric outcomes is weak. With the current available evidence, we suggest that MNPs in children is associated with a 34% decrease in the incidence of anemia. The evidence of increased diarrhea suggests careful evaluation of the associated risks. In this systematic review our objective was to summarize the effect of MNPs on the health outcomes of women and children. We did not find any study reporting outcomes on women and seventeen studies were included that reported on various outcomes on children. The studies contributing data in this review were conducted in developing countries hence increasing the generalizability of the studies to children in low and middle income countries with the highest undernutrition rates. Most of the studies were effectiveness trials evaluating the impact of MNPs in community settings. All of the studies were on children less than six years of age, except two studies [30, 39] that included children over 6 years of age although the subgroup analysis for children under five did not show any difference in the findings. Clinical heterogeneity was observed due to variations in type of intervention (number of micronutrients used ranged from 3 to 15), duration of the intervention (2-24 months), target population and different time intervals for follow-up. All the MNPs used contained iron in their composition. The intervention was mostly reported to be acceptable by the mothers and children and there was no major loss to follow-up reported due to the intervention in any of the included studies. There have been no adverse events identified by any study except one  that reported increased diarrhea in the intervention group compared to control. This review shows that MNPs raise serum hemoglobin levels and reduce anemia significantly, but the evidence on growth is weak, as relatively few studies have evaluated this outcome. Improved hemoglobin and anemia status could be attributable to the iron component in all the MNPs used. Some studies have reported benefits on other developmental outcomes like walking by 12 months but not on growth . This could be due to relatively shorter duration of the intervention to show actual long term impacts. These findings also suggest that multiple micronutrient interventions alone might not improve growth outcomes. To ensure long term impacts and sustainability, health education that aims to modify food habits would be necessary to improve child growth rates. Also, if the intervention initiation coincides with the child’s diet transition from breast feeding to complementary feeding, the results may show improved growth. The finding of significantly increased diarrhea is potentially alarming. It is mainly based on the significant increase in diarrhea observed in one large trial . The association between increased diarrhea with iron supplementation is well recognized in the literature and is also reported in a review on iron supplementation by Gera . However, our finding of excess morbidity and negligible growth benefit cannot be ignored in settings where large scale use of MNPs is being considered. The increased diarrhea burden could be one of the potential explanations for reduced growth benefits of MNPs. The evidence is weak for any effect of MNPs on growth, as there were very few studies pooled for each outcome. More research is needed and studies need to report the outcomes of stunting, wasting, morbidity and mortality consistently to strengthen the evidence and evaluate its actual impact on growth and morbidity. A major research gap identified was that there were no studies evaluating the impact on women as all the studies targeted children only. Our analysis of the effect of MNPs in children suggests benefit in improving anemia and hemoglobin however there is lack of impact on growth. Evidence of increased diarrhea requires careful consideration before recommending the intervention for implementation at scale. This work was supported in part by a grant from the Bill & Melinda Gates Foundation. Dr. ZAB was responsible for designing the review and coordinating the review. RAS, CM and JKD were responsible for: data collection, screening the search results, screening retrieved papers against inclusion criteria, appraising quality of papers, abstracting data from papers, entering data into RevMan, analysis and interpretation of data and writing the review. ZAB and RAS critically reviewed and modified the manuscript.